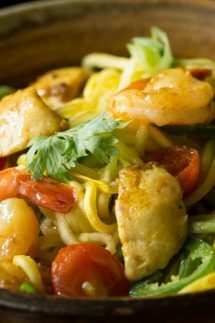 What are Singapore Street Noodles? Did you know that Singapore Street Noodles don’t, in fact, come from Singapore? Some sources  suggest that they are actually Cantonese street food, so I have no idea why they have the name that they do! They are very popular in Chinese restaurants here in the USA and it’s one of my favorite dishes to have from the gluten free menu at PF Changs. It’s a simple, classic stir fry dish that usually includes very thin rice noodles or vermicelli, though for this low carb paleo version I’ve opted for zucchini noodles instead. 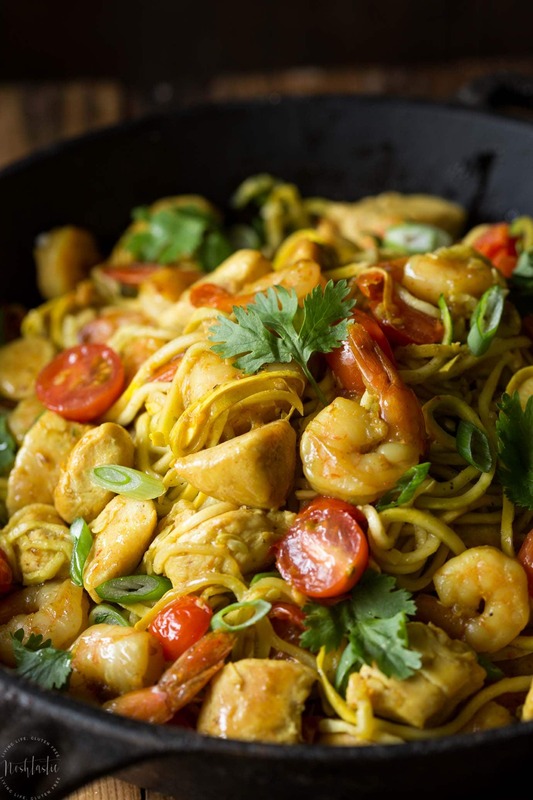 The protein content varies widely depending on what recipe you choose but often includes some combination of shrimp, pork, chicken and egg, though not necessarily all of them in one recipe. I’ve added shrimp (prawns) and chicken breast in this version. The finished noodle dish usually has a vibrant yellow color. I’ve achieved this with a combination of turmeric and curry powder in the sauce. Personally I think the addition of curry powder is what sets this apart from an average stir fry that relies mostly on soy sauce for flavor. The authentic curry sauce is really easy to make, simply add the sherry, curry powder, coconut aminos (or gluten free soy sauce if you are not paleo/w30), turmeric, and pepper to a bowl, and mix together. Cut up and prepare the chicken, shrimp, garlic, cherry tomatoes, Jalapeno peppers, cilantro and scallions as directed in the recipe. Next, you will need to get out a wide bottomed pan to make this, you don’t need to use a wok. Start by cooking the chicken first as it will take the longest, then cook the shrimp separately after the chicken. Then, add in tomatoes, zoodles, scallions, shrimp and cook until warmed through for about 2-3 minutes, do not overcook the ‘noodles’, they literally only need to be warmed through for a minute or so as they can create a lot of liquid and turn soggy if you overcook them. I recently made these Slow Cooker Baby Back Ribs with an easy homemade rub that will transform these slow cooker ribs from good to great! They cook over a few hours in the slow cooker and while they are cooking you can make the delicious BBQ sauce and let it simmer on the stove until the ribs are ready. How about some Lemon Pepper Chicken? I’ve always loved Lemon Pepper flavors! My recipe is 100% from scratch and includes fresh lemon zest and some other simple spices to really amp up the flavor, it’s so much better than straight from the bottle! My friend Taylor from Food Faith Fitness has a delicious Vegan Sweet Potato Noodle Coconut Curry that looks tremendous, plus it’s Paleo too! Lastly, these awesome Smashed Potatoes make a fabulous side that would go with almost any main course, they are so crispy and delish! 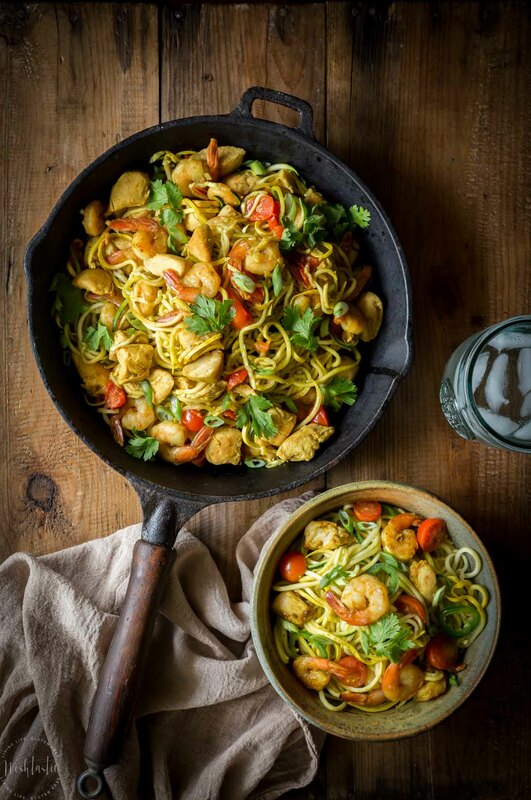 Paleo Singapore Noodles, made with zucchini noodles - zoodles , shrimp, chicken and tasty mild curry flavored sauce with added turmeric! 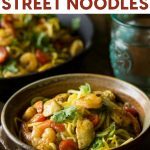 This Singapore street noodles recipe is packed with authentic flavors, it is Gluten free, healthy, low carb with Whole30. 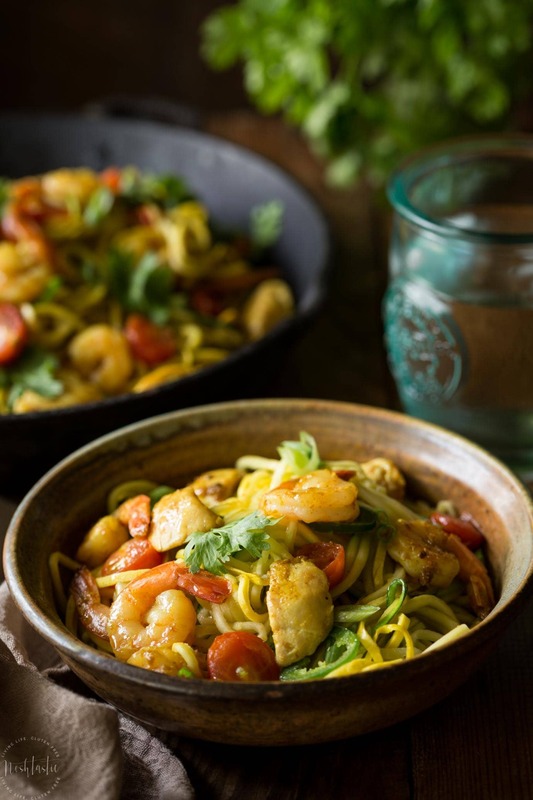 If you're looking for a PF Chang's Street Noodles recipe to make at home, this is it! Make the curry sauce by adding all the sauce ingredients into a bowl and mixing well. Chop and prepare and all the vegetables, chicken and meat as directed so that you are ready to cook them quickly. Heat the oil gently in a large wide bottomed pan and lightly fry the chicken for a 4-5 minutes on a medium heat, stirring all the time until cooked through, then remove the chicken from the pan and set to the side. Quickly cook the peeled shrimp in the same way until it's pink, it should only take a minute or two, and remove it from the pan and set to one side. Return the cooked chicken to the pan, along with garlic, curry sauce, and jalapenos, and cook for 3-4 minutes, stirring all the time. Add in tomatoes, zoodles, scallions, and shrimp and cook until warmed through for about 2-3 minutes. Be careful not to overcook the 'noodles' or they will turn to mush and produce a lot of liquid. I’ve made this recipe twice now and my husband loved it, thank you so much!! That’s so great to hear, thank you Jo! Can I use spaghetti squash instead of zoodles?? Hi Amy, I’ve not tried that but I bet you could! I would perhaps cook the squash separately and then simply stir it in right at the end and see how that works. Video? I could not find a link, though the recipe looks great. There was a problem with the video code, sorry about that. You should see it now above the recipe card on mobile (you’ll need to click to play) and it will autoplay at the top of the post on desktop, then slide over to the side when you scroll. Great, but this would work much better with daikon noodles, not zucchini. Just as low carb, but less moist.